We believe this is a foundational value to the success of our programs. We print a monthly prayer listing that is widely distributed by mail, email and also here on our website. Annual budget is $475,000 of which $248,302 is needed from contributions. Currently, almost 100 local churches and businesses contribute regularly, as well as personal donations come from about 300 people annually. We also have needs for donated Bibles and Christian books. 3. Distribute quarterly newsletters, monthly prayer lists, and other informative literature about prison ministry happenings and opportunities. Currently, we have almost 100 churches and community agencies that distribute our newsletters. 4. Resource Source Speakers. Director Del Burkholder, Ne lson Martin, staff chaplains, and ex-inmates are available to preach, teach classes, meet with mission committees, men’s prayer breakfasts, community organizations, etc. to help educate the public about opportunities for local mission with those behind bars, persons being released and their families. 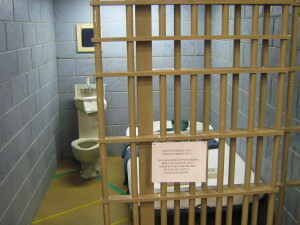 We also have a 6 X 8’ furnished model of a prison cell that is a very effective visual aid. 5. Support for/volunteer with aftercare/transitional ministries. We network with a number of faith based agencies that help inmates (men and women) when released. 6. Clergy approval for LCP/YIC visitation. About 2,600 one-on-one clergy (or other representatives of congregations) visits happen each year. Prior approval for visiting is needed and schedules are cleared through LCP chaplain’s office # 295-2088 or 295-2089. For full information click on “Prison Access” tab. 7. Inside staff Chaplains, badged volunteers, support staff. Currently the Prison is crowded which brings various restrictions on how many chaplain staff are allowed entrance. However, we are always interested in knowing who has a calling and interest for possible future chaplaincy involvements.